Over the last 10 years the Kings Cross area has undergone a huge transformation. From industrial wasteland to chic converted Victorian warehouse spaces and shiny brand new offices, the best thing about the renovation so far has got to be Granary Square. An unexpected respite from the busy Kings Cross and St Pancras train stations, this cobbled square is a lovely little spot – especially when the sun is out. With exactly 1,080 choreographed fountains this is a great alternative to a playground if you have little children, they’ll have a great time running through the fountains while parents can relax on one of the benches. With it being in such close proximity to these busy stations you needn’t plan too much in advance but it could easily tie the trip in as a little detour if you happen to be passing through either of the stations. 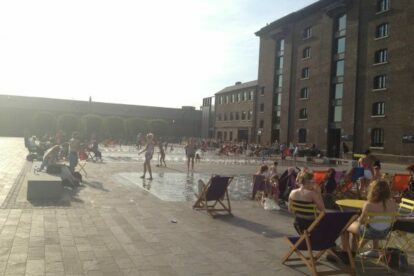 There are a few restaurants on Granary square –Caravan, Dishoom and The Grain Store- which have outside seating areas so that you can soak up the atmosphere whilst grabbing something to eat or even just a glass of wine, the fountains are particularly impressive on an evening when they not only dance around in synchronised heights but colours too!